I had posted about this a few months ago. 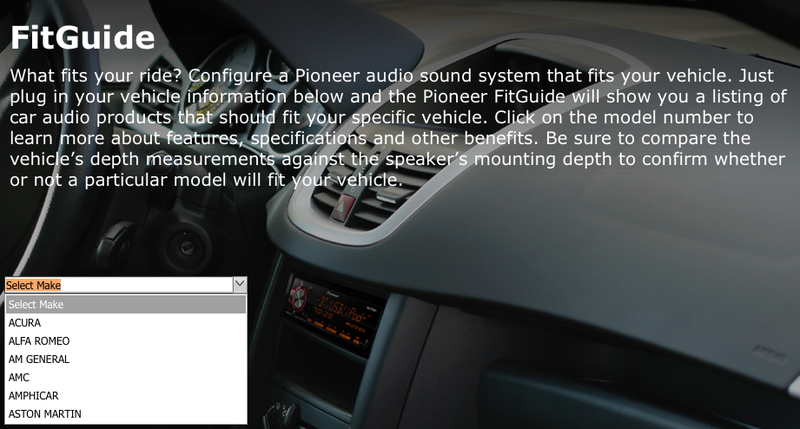 Pioneer Electronics has an online "FitGuide" which can be used to find the perfect sound system for your car. No matter what car you drive or how old it is, upgrading the head unit or sound system is possible in most cases. The in-car entertainment software that's dominating the field right now is Apple CarPlay and Google Android Auto. The great thing about aftermarket head units is that you can get to enjoy that piece of technology in the car you already own. Pioneer's second generation NEX head units offer both CarPlay and Android Auto. But to make sure those or any other double-DIN head units fit in your car, the FitGuide tool is a great place to start. Input your car details using the drop down menus on the website. The FitGuide will display the existing factory-installed configurations of your car along with the options you have for upgrading. You can then choose from head units, speakers, subwoofers and amplifiers. Other installation products may be required like dash kits and wiring harnesses which are not sold by Pioneer. Cable kits for smartphone connectivity are also required for most head units which are not included and have to be purchased separately.